"Not only is this recipe simple and fast to make, but it's so full of flavor that it will taste like you spent hours on it! 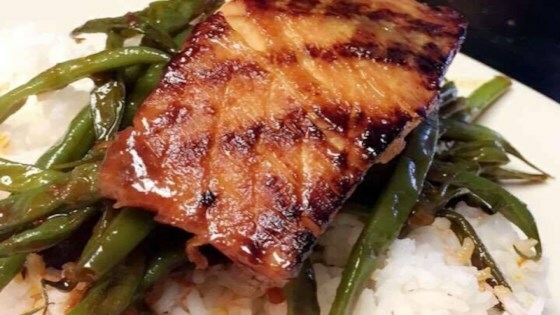 Serve the miso-glazed salmon over Sichuan-style French beans and rice." Whisk mirin, miso, soy sauce, brown sugar, and lime juice together in a bowl or high-rimmed tray. Immerse salmon fillets in the marinade. Marinate for 15 minutes. Heat a well oiled grill pan over medium heat. Add the salmon fillets, reserving marinade in the bowl. Cook, flipping as needed, until grill marks form, 2 to 3 minutes per side. Remove from heat. Place salmon fillets onto a baking sheet and spoon reserved marinade over each fillet. Bake in the preheated oven until fish flakes easily with a fork, about 6 minutes.